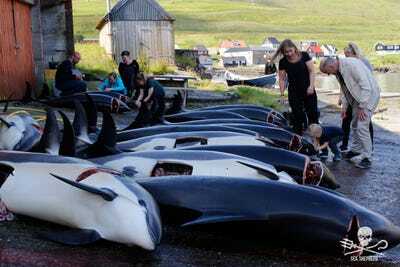 Sea ShepherdLocals on the Faroe Islands tend to newly-killed whales after a hunt. 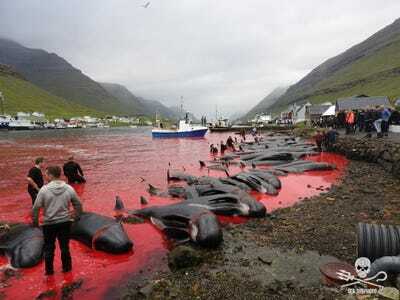 Eco-campaigners Sea Shepherd published gory photos of whales and dolphins being slaughtered in the Faroe Islands. 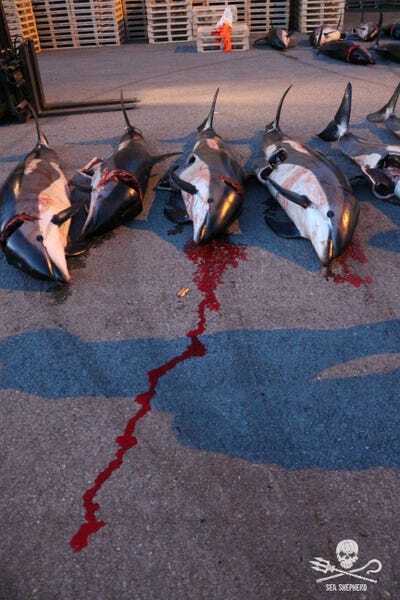 Around 1,200 whales and 500 dolphins were killed in the so-called whale drives. 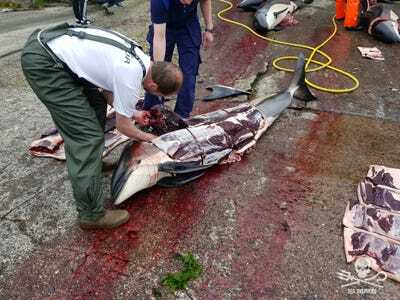 The Government of the Faroe Islands defended the practice as part of their heritage. 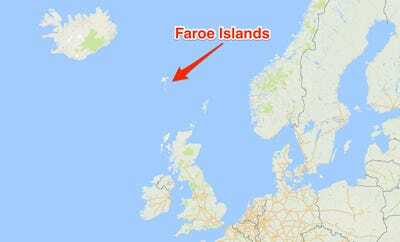 They documented a series of so-called whale drives, in which the Faroese government says around 1,200 whales and 500 dolphins were killed. 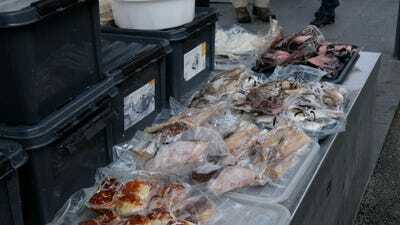 A statement from the Government of the Faroe Islands defended the centuries-old practice as part of their natural heritage, and an important source of food. Read on the see what the controversial hunting practice looks like, and learn more about its history. 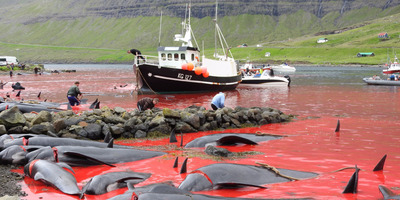 EU law (this one) bans 'deliberate capture or killing' of any dolphins or whales, but since the Faroe Islands are not part of the union they do not have to abide by the rules. This whale was pregnant -- her baby ended up dying as well. The animals are marked up for processing -- if you look closely you can see the number 16 on this dolphin, next to the fin. 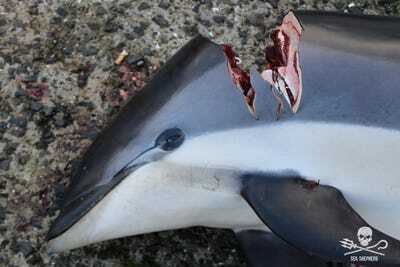 The animals are butchered for meat and blubber -- here one man has sliced parts of this dolphin. 'Witnessing a 'grind' first-hand was truly an eye-opening experience. In a place otherwise so quiet, it was unnerving to see the locals so animated once the grind had been announced. 'The first grind we saw was at Hvannasund, scene of several grinds in 2017. We witnessed the whole process from the driving in of the 50 or so pilot whales through the slaughter, the butchering and the distribution of the meat and blubber. 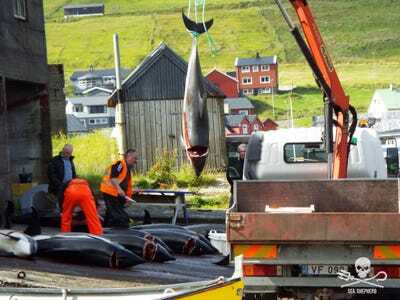 The Faroese government defends the tradition, and says Sea Shepherd will 'go to any lengths' to discredit them. 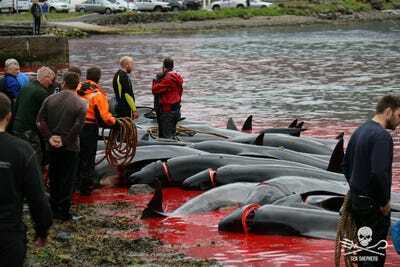 'Approximately 1700 pilot whales and white-sided dolphins have been caught in the Faroe Islands so far this year. 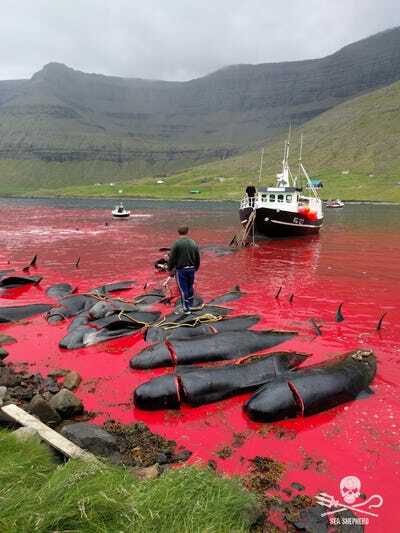 The annual long-term average catch of pilot whales in the Faroe Islands is around 800 whales, with large fluctuations in total catches and the number of individual whale drives from year to year. 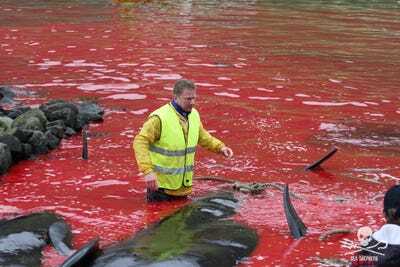 'The pilot whale hunt in the Faroe Islands is sustainable. The long-term annual average catch of pilot whales in the Faroe Islands represents less than 1% of the total estimated stock. 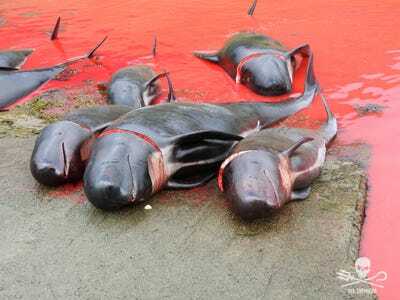 It has long since been internationally recognised that pilot whale catches in the Faroe Islands are fully sustainable. 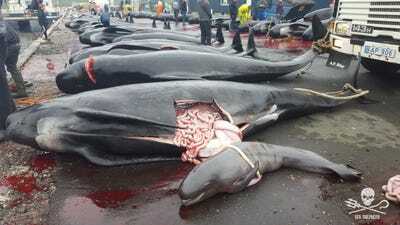 'All meat, including whale meat, involves the slaughter of animals. The meat and blubber of pilot whales have long been - and continue to be - a valued part of the national diet. Catches are shared largely without the exchange of money among the participants in a whale drive and residents of the local district where they are landed. Each whale provides the communities with several hundred kilos of meat and blubber -- meat that otherwise had to be imported from abroad. 'Sheep farming, whaling and fowling have enabled the Faroe Islands as an island nation to maintain a relatively high degree of self-sufficiency in food production. In the Faroe Islands it is considered both economic and environmental good sense to make the most of locally available natural resources, and to maintain the knowledge required to use what nature can provide in a harsh oceanic environment. 'Illegal and potentially dangerous actions by activists from the Sea Shepherd Conservation Society have been the hallmark of the activities of this group for decades. 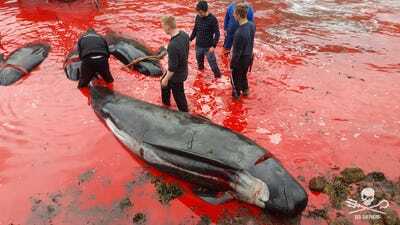 'Sea Shepherd representatives will go to any lengths to paint a negative picture of the Faroese whale hunt as 'barbaric', 'unnecessary', 'evil' and 'lunacy' describing Faroese as 'sadistic psychopaths', with the aim of inciting anger and outrage against the people of the Faroe Islands.